-Imagine contracting half a billion loan two days before elections? – What was the real motive ? 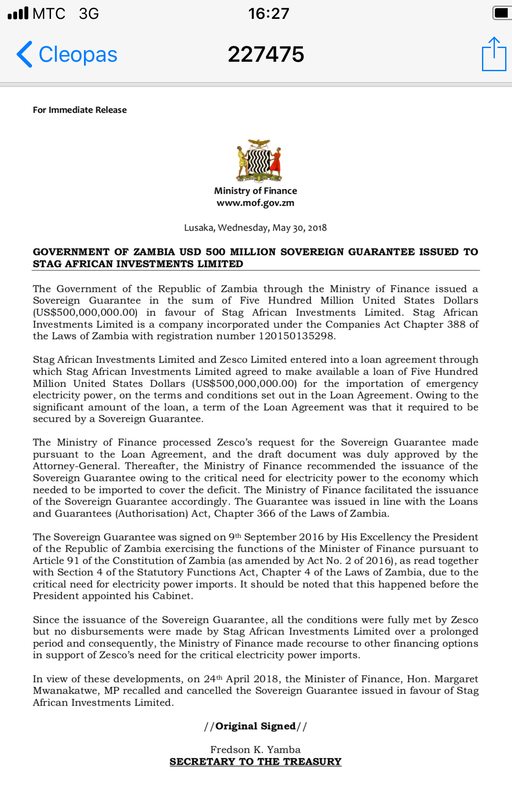 The Government of the Republic of Zambia through the Ministry of Finance issued a Sovereign Guarantee in the sum of Five Hundred Million United States Dollars (US$500,000,000.00) in favour of Stag African Investments Limited. the Laws of Zambia with registration number 120150135298. Million United States Dollars (US$500,000,000.00) for the importation of emergency electricity power, on the terms and conditions set out in the Loan agreement. Owing to the significant amount of the loan, a term of the Loan Agreement required that it be secured by a Sovereign Guarantee. The Ministry of Finance processed Zesco’s request for the Sovereign Guarantee made pursuant to the Loan Agreement, and the draft document was duly approved by the Attorney-General. Sovereign Guarantee owing to the critical need for electricity power to the economy which needed to be imported to cover the deficit. The Ministry of Finance facilitated the issuance of the Sovereign Guarantee accordingly. The Guarantee was issued in line with the Loans and Guarantees (Authorisation) Act, Chapter 366 of the Laws of Zambia. In view of these developments, on 24th April 2018, the Minister of Finance, Hon. Margaret Mwanakatwe, MP recalled and cancelled the Sovereign Guarantee issued in favour of Stag African Investments Limited.